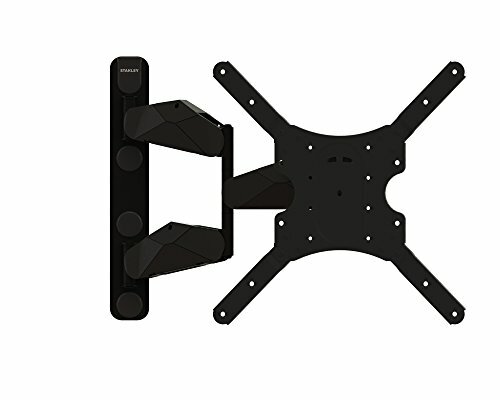 Stanley TV Wall Mount - Super Slim Tilt Mount for Large Flat Panel Television 37"-70"
The Stanley TLR-ES2215T Tilt Mount is for medium to large size Flat Panel TVs. Stanley, the leading name in hardware, tools and DIY projects now has a full line of easy to install and operate TV mounts. The TLR-ES2215T mounting system features a slim and sleek design for a clean and low profile appearance. With only a 2.2” depth from the TV to the wall, it saves space in the room and a safe way to display your TV. The TLR-ES2215T is capable of accommodating most 37” to 70” televisons weighing up to 85 lbs. It has a 600 x 400 VESA pattern. 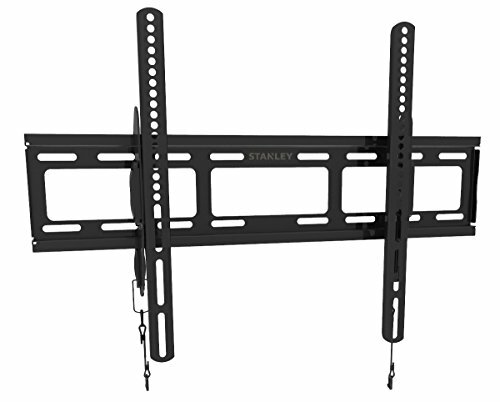 Stanley TV Wall Mounts come with easy to follow method of “Measure, Mark and Mount” to hang your Flat Panel and display your latest technology purchase. It includes all necessary hardware for installation in wood studs with drywall and/or concrete. Stanley TV Wall Mounts are constructed with high quality components for ultimate rigidity, strength and durability. Decorative caps and integrated cable covers are included so that it provides an elegant appearance from all angles. Stanley provides a full three year warranty and customer support. 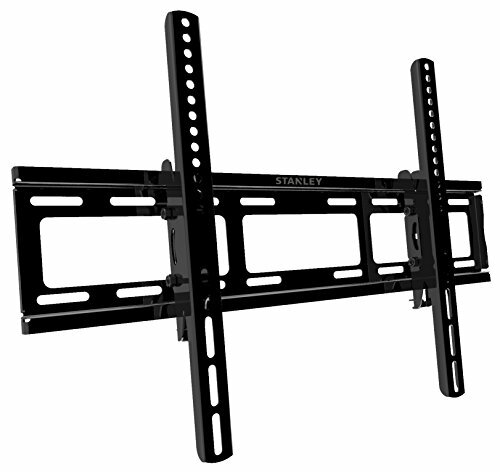 The Stanley TLR-EC3215T Mount is for large size Flat Panel TVs. Stanley, the leading name in hardware, tools and DIY projects now has a full line of easy to install and operate TV mounts. The TLR-EC3215T mounting system features a slim and sleek design for a clean and low profile appearance. With only a 2.2” depth from the TV to the wall, it saves space in the room and a safe way to display your TV. The TLR-EC3215T is capable of accommodating most 37” to 70” televisions weighing up to 110 lbs. It has a 600 x 400 VESA Universal pattern. Stanley TV Wall Mounts come with easy to follow method of “Measure, Mark and Mount” to hang your Flat Panel and display your latest technology purchase. It offers Click and Release mounting system for easy cabling ad back of TV access. It provides clean and secure cable covers that hold cables in place for a fine finished appearance. It includes all necessary hardware for installation in wood studs with drywall and/or concrete. Stanley TV Wall Mounts are constructed with high quality components for ultimate rigidity, strength and durability. Decorative caps and integrated cable covers are included so that it provides an elegant appearance from all angles. Stanley provides a full three year warranty and customer support. 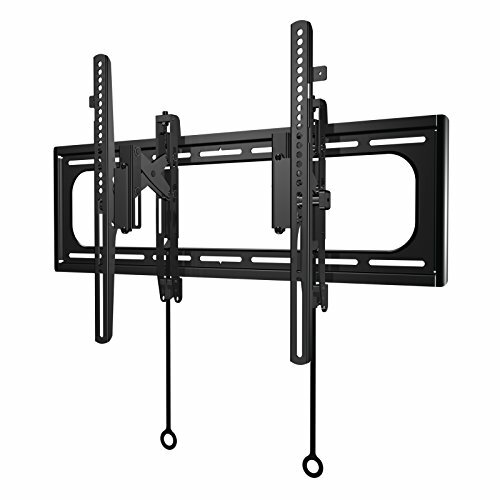 This heavy duty articulating wall mount offers extreme versatility with a maximum extension of 20.3" from the wall. It is suitable for LCD, Plasma or LED TVs, in sizes ranging from 32" to 60". 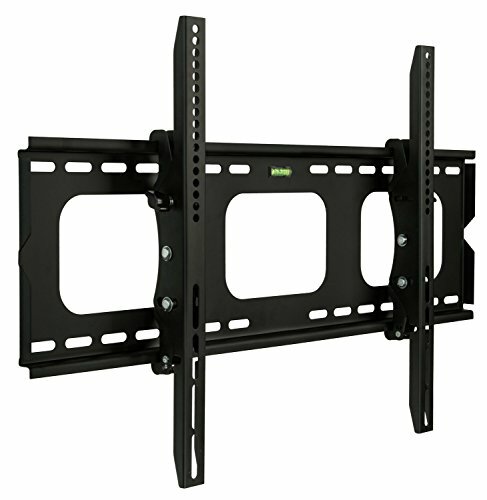 Its dual arm design is incredibly sturdy, and supports a wide range of plasma and LCD flat screen televisions. Mount swivels from left to right for viewing from multiple angles. Continuous tilt motion is possible without the use of tools. Powder coated steel construction provides a sleek, high-tech look. Security locking mechanism to prevent the TV from unlatching from mount. Built in lateral shift. Built in bubble level included in backplate for convenience. 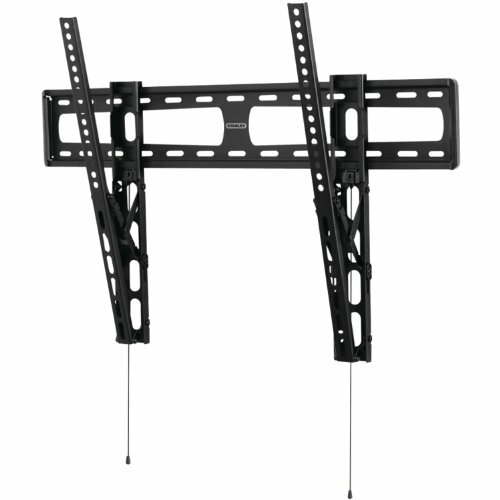 Universal mounting brackets fit nearly all flat-panel TVs Ideal for corner installations. Includes complete hardware kit and installation instructions. TV Size Range: 32" - 60" Max TV weight: 175 lbs Mounting Pattern: Universal and up to VESA 700 x 400 Suitable TV Mounting Holes: up to 30.3" apart horizontally and up to 18.5" vertically Wall plate dimensions: 19.7" wide by 10" high. Tilt: + / - 15 degrees up or down and any angle in between Swivel: 45 degrees to left or to right Extension from the wall: between 4.5" to 20.3". Long gone are the days when you needed a TV stand to display your television. Introducing the Atlantic full motion articulating mount. Designed to display screens anywhere from 37” to 84”. 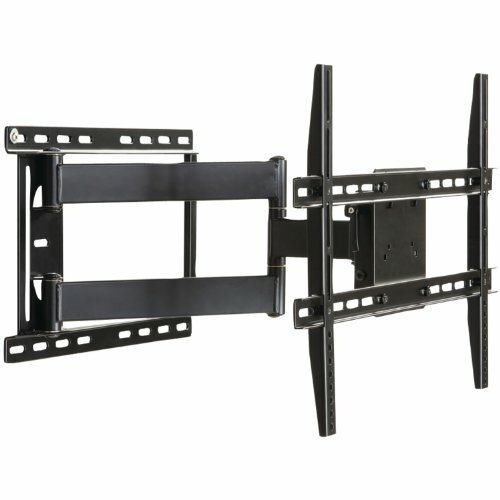 With the Full Motion Articulating Flat Screen TV Wall Mount you can mount your large flat screen TV with confidence! 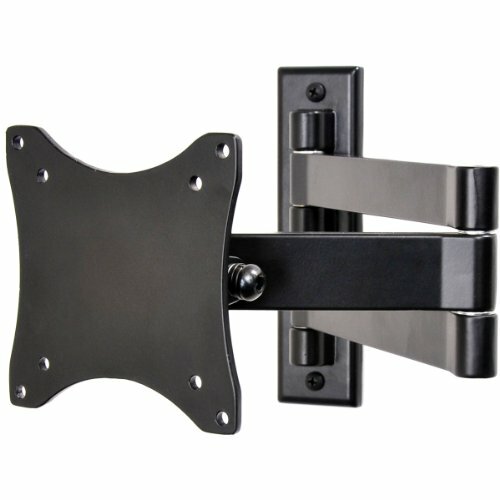 This heavy duty piece of home entertainment hardware mounts on a wall stud, brick, or concrete. Perfect for the family room, media room, den, or bedroom. 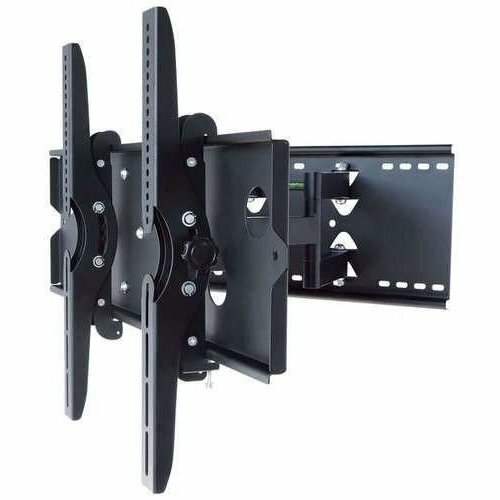 The Large Full Motion Articulating Flat Screen TV Wall Mount allows you to enjoy your safely and securely mounted flat screen TV in comfort. You can enjoy a great picture no matter where you sit: tilt, swivel, extend and level your TV without the need for tools. Looking for more Large Tilt Flat Panel similar ideas? Try to explore these searches: Replacement Truck Carpet, Matrix Control, and Watts Linkage. Look at latest related video about Large Tilt Flat Panel. Shopwizion.com is the smartest way for online shopping: compare prices of leading online shops for best deals around the web. Don't miss TOP Large Tilt Flat Panel deals, updated daily.